It turned out beautifully without the mold. Bonus, you can make it again with the mold! It looks lovely, but I am jealous that I didn't think of those cute stars! What a great idea, very,very adorable! I love the stars! I didn't use the fancy equipment either. I'm glad you like it. I think I might try freezing it next time. Also, I wish I would have done a strawberry thing. I love the flavor of raspberries but I cannot stand the little seeds- they make me gag. I love the stars. I, too, used strawberries. beautiful pics, i like the stars. i'd like to try this with strawberries the next time i make it. It looks beautiful and the pictures you took are quite striking. I love the stars--what a great idea and smart to make the vanilla sugar too. Beautiful pictures--the strawberries look so nice! Really great pictures! Looks refreshing and de-lish! Wow, that looks really delicious! I love the way the strawberries look against the white stars. The last picture is my favorite. I love the star shapes! And your photos are absolutely gorgeous! Thanks for the link for the Vanilla beans! I can't wait to get some! Oh my, look at how pretty the red is! This is a gorgeous recipe! Anne, I had no idea you were so into cooking and baking! I just looked at every single recipe that you have posted and I am a starving pregnant lady right now!! You take such great pictures as well. You are inspiring me to create my own blog of things I make. Maybe when our house is finished and I have alot more room to bake! Oh how I LOVE to bake!! Good to see you are doing well, Anne! I am putting you on my link list for sure! 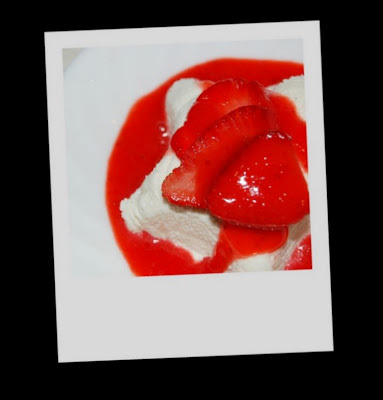 Wow, the red of your strawberry sauce looks amazing! I agree, this was creamy but light enough for summertime. I heart Ina.